How did you get into cricket commentary? I was fortunate that Sky Sports came along after I retired from playing. Martin Crowe had moved into that realm as well after his retirement. He was the executive producer looking after the cricket department, Smithy (Ian Smith) was always there doing broadcasting with TVNZ. I got a chance with TVNZ before Sky took over. That helped me gain some insight in to broadcasting and commentary. Then cricket max came along, the Martin Crowe game, a bit like T20 with four lots of ten overs, so that helped me as well. I was doing all these before I got in to the international scene. 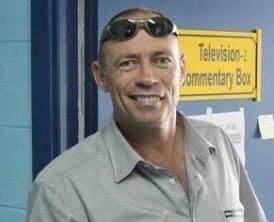 Today, it’s a real changing landscape for us commentators with so much more cricket like IPL, CPL and the Big Bash. I’m very grateful to be doing a lot of these and I totally enjoy the varied experience. You have a unique style with your antics before the microphone.Does it come naturally to you? Think of it as more of a singing style, people have asked about it. I tend to drag out a word like, “thisssssss isssss out of here”, People have given me grief for that sort of stuff because it’s not conservative. It happens in rugby all the time, there is drama and there are antics. I think T20 is a format that lends itself to enthusiasm. It’s fast, furious and I tend to bring that out in the commentary box too. In addition it’s just who I’m really, I’m a little bit cheeky, wild and crazy, and I don’t make excuses of it, that’s how I handle myself on and off the commentary box. How do you take it when people criticize you for being over the top? I can’t be bothered about it. I get it all the time in twitter; they call me an idiot, clown and many other names. You have to be thick skinned if you want to do this job. As a player someone gets lots of abuses. I have got it from the Aussie crowds all the time. So when you put yourself out there you automatically start to develop a thick skin. I always get abuses even as a commentator for things like what I’m wearing, what is this clown up to. But T20 is an entertainment business, it’s not Test cricket, the action is fast. When I do a Test match, I tend to wear the conservative hat and slow down a lot and be more analytical and practical. But T20 is fast, furious and fun so you have to adapt to that in the commentary box too. How focused should you be when you are not on air, do you really need to watch the ball-by-ball action? Yeah, I do. I think there is no excuse not to. In Test matches, you might be doing an email or doing an interview, but in T20 you need to, because it changes so quickly. You’re not off very long, it’s a short commentary stint and it’s all bang, bang, bang and its only one and half hours. So you’ve got be watching everything, really. Who do you think complements your style well in the commentary box? I love working with Bish, he is a gentle giant. He is quite articulate and knowledgeable and can complement me quite well. Pommie Mbangwa can be entertaining with me as well. They kind of absorb some of the outrageous stuff I do. Most of the guys in IPL, I love to work with, because they get what I try to do, they actually understand that this is entertainment and it’s not test cricket and we’re here to rip it up. What do you do apart from TV commentary? I work with Brad Murphy in the Sunshine coast club team in Brisbane. He runs an under-18 academy. I’m trying to get some Indian academies involved with this as sort of an exchange program at the school level. I’d love to develop that part of the program. I’m trying to think about doing that and putting that into process at the under 18 level for high school students to come out of high school and experience the different conditions in Australia and vice versa. I enjoy working with the youngsters and help them develop in to better cricketers and hopefully better people. How would you compare your commentary stint with your playing days? They are very different animals. You’re playing and you’re actually doing it on the field. Playing is intense; you are taking criticism and handling pressure, whereas commentary you’re living a dream. You’re doing live ball-by-ball sure and the adrenaline is there, but it doesn’t have the same sort of massive pressures of getting out or bowling badly and getting smashed around the park. The other naughty thing of recent times, don’t want to mention names is that, if you say unwanted things in the commentary box, you get caught and you could lose your job. I certainly enjoy both but playing meant a lot to me as an individual. Going back to your playing days, tell me about your early days, how did you get interested in cricket? My fascination towards cricket really started when I moved from West Auckland to North shore when my parents split in the mid-70s. I went and lived with my mother’s brother. We just did different things, we surfed, sailed and then I got introduced to cricket when I was about Ten or Eleven. I remember watching Dennis Lillee and Richard Hadlee on TV in 1977. That sparked my interest and that was the catalyst. Then I moved back to New Zealand in the early 80’s and started playing for Auckland and before I knew I was in the under-19’s and in a couple of years I made my Test debut and It all happened pretty fast for me. You mentioned Sir Richard Hadlee, your thoughts on him and sharing the new ball with him. He is probably in the top 10 of all time fast and fast medium bowlers the game has ever seen. For me it was an absolute joy and privilege to have roomed with him, learnt from him especially on the park. Incidentally my first three years coincided with his last three years so it was a great learning opportunity for me. More than anything it was a privilege to have toured with him to India and Australia. Talk to us briefly about your moments as a player representing New Zealand? My Test debut playing with Hadlee, the Crowe brothers, John Bracewell and Ian Smith, all those guys I’ve been watching only on TV and suddenly you’re playing alongside them as a 21-year-old, So that was a real blast. Touring Australia in 1987 was one of the highlights for me. The World Cup at New Zealand at home in 1992 with colored clothing and white balls was phenomenal. The hat trick against India, Which made me the first New Zealander to get a hat-trick in a One Day International, so that was pretty special as well. I loved duck hunting. I mean scoring ducks in Tests. Saving the Test match with Nathan Astle and batting with sunglasses. I have to say I had a real blast as a player. Any regrets as a player? I think I could have got more out of my frame, but I had joint problems. I probably would have liked to play for a couple more years, but my frame and body did not allow it. I wanted to do it because I loved it and we traveled the world. I could have pushed myself a bit more. So yes I would have liked to play a little longer, maybe another year or two. At the same time, I can’t be ungrateful for the opportunities I got and the things I did. I really loved it and enjoyed it. I know he’s not the most popular commentator, but tbh, I do enjoy his style of commentary. Seems like a nice enough guy too. Good stuff Venkat. He is right about Bish and him as commentary partners. Hey, wasn’t there an interview with a fielding coach lined up? He’s probably a terrific bloke – his test match commentary is average (in a bad way) unless he is retelling stories about epic last wicket partnerships with Martin Snedden. Fun interview to read. Refreshing honesty about his commentary, and seems like a great guy. I’d call his commentary abysmal. And from his interview, he knows his commentary is **** as well. Sure, adapt to the fact that T20 is fast and furious but don’t be a **** about it.